Recorded, mixed and produced by Mark Mynett at Mynetaur Studios. Drums and vocals recorded by Pete Miles at Forge Hill. Mastered by John Blamire at Digital Audio Co. Released on Siege of Amida Records on 25 June 2007. There are some albums that you just get into immediately; something about them just resonates with you. Others take a bit more work before you finally ‘get’ what it’s all about. Sometimes it’s just about putting in the hours and listening to it again and again, other times it’s about listening to the tracks out of order—which is what I needed to do for Mastodon’s last album— or simply listening to the album in a different context (listening in the car or on an MP3 player rather than a stereo). It was while listening to this album one night in bed on my phone that it finally made a little more sense to me. Maybe this is a good lesson that I need to listen to each album on this project at least once out loud on my PC’s speakers and once on headphones before I make a judgement. This is the first and only full-length album from now-disbanded Hampshire death metal/grindcore (deathcore?) unit Chaos Blood and it’s not a bad release, to be honest. The album has some good riffs, breakdowns, and decent growling death-metal vocals that aren’t too monotonous. That said, the whole album does sound rather same-y. One song often blends into the next with little variation. A brutal onslaught of distorted guitars and drums interspersed with moments of genuine interest. One exception is track three, “Raised by Wolves” which slows things down, kicking things off with a lamentful, descending riff for 30 seconds before unleashing a wall of noise that then morphs into a start-stop bouncing riff around 58 seconds in. It’s interesting, it’s even rather fun. 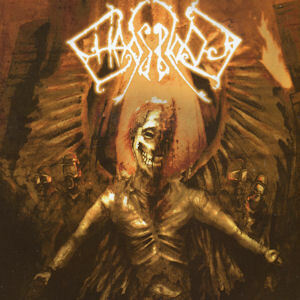 Another favourite is the title track, “Fragments of a Shattered Skull” which has a nice melodic guitar break about a minute into its 4:39 length which then twists into an almost acoustic jam, reminiscent of one of Soulfly’s self-titled offerings, before finishing off in the realms of Iron Maiden. “Cranial Manouevre”, track 7, kicks off with an un-metal drum pattern and bass riff that reminds me a little of industrial band Circle of Dust. Around 54 seconds in Chaos Blood return to their roots with a bit of a deathcore rant. Throughout the rest of the song there are moments where they hint at taking another direction, but these turn out to be short breathers before continuing with the relentless, machine gun riffs. The penultimate track “Levitation Technique” feels a bit more like a traditional death metal song with some imaginative solos around a third of the way in, and an opening riff that repeats a various points throughout the track. The second half of the song slows down into an almost industrial beat and then all of a sudden at 2 minutes 40 seconds the machine dies and the track ends. Brilliant! In terms of lyrics… I have no idea! But on an album like this I always treat the vocals as another percussive instrument. I must have listened to this album about ten times by now and I quite like it. Whether that’s just because I’ve been worn down by the barrage of blast beats or because I genuinely like it, I’m still not entirely sure. It’s a shame that Chaos Blood split up after only one album. I’d have liked to have heard where they went next. They do the grindcore/deathcore thing very competently, but at times the playing-at-220-bpm parts feels like padding. For me, the real interest in this album lies in those moments when you can hear the band’s personalities and influences shining through: the slowed down parts, the stop-start riffs, the death metal solos, the bouncing riffs, and melodies. Individually, a lot of the tracks are very good. But together, I still don’t quite understand the statement that is being made. I still haven’t fully experienced the journey. As an exercise, it would be interesting to reorder the tracks and see what a difference it makes. I suspect that this is much better album in the ‘wrong’ order. I couldn’t find any of the tracks I mentioned above on YouTube, here’s the only one I could find as part of a compilation.